Patients with the same illness often receive the same treatment, even if the cause of the illness is different for each person. This represents a new step towards ultimately being able to offer every patient more personalized treatment. Six Dutch universities are combining forces to chart the different disease processes for a range of common conditions. This represents a new step towards ultimately being able to offer every patient more personalized treatment. The results of this study have been published in two articles in the authoritative scientific journal Nature Genetics. The researchers were able to make their discoveries thanks to new techniques that make it possible to simultaneously measure the regulation and activity of all the genes of thousands of people, and to link these data to millions of genetic differences in their DNA. The combined analysis of these ‘big data’ made it possible to determine which molecular processes in the body become dysregulated for a range of disparate diseases, from prostate cancer to ulcerative bowel disease, before the individuals concerned actually become ill.
“The emergence of ‘big data’, ever faster computers and new mathematical techniques means it’s now possible to conduct extremely large-scale studies and gain an understanding of many diseases at the same time,” explains Lude Franke (UMCG), head of the research team in Groningen. The researchers show how thousands of disease-related DNA differences disrupt the internal working of a cell and how their effect can be influenced by environmental factors. And all this was possible without the need for a single lab experiment. The success of this research is the result of the decision taken six years ago by biobanks throughout the Netherlands to share data and biomaterials within the BBMRI consortium. This decision meant it became possible to gather, store and analyze data from blood samples of a very large number of volunteers. 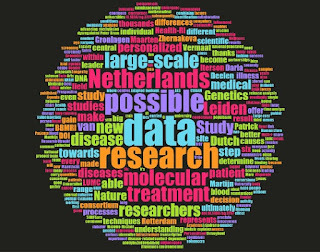 The present study illustrates the tremendous value of large-scale collaboration in the field of medical research in the Netherlands. The research has been made possible thanks to the cooperation within the BBMRI biobank consortium of six long-running Dutch population studies carried out by the university medical centres in Groningen (LifeLines), Leiden (Leiden Longevity Study), Maastricht (CODAM Study), Rotterdam (Rotterdam Study), Utrecht (Netherlands Prospective ALS Study) and by the Vrije Universiteit (Netherlands Twin Register). The molecular data were generated in a standardized fashion at a central site (Human Genomics Facility HuGE-F, ErasmusMC) and subsequently securely stored and analyzed at a second central site (SURFSara). 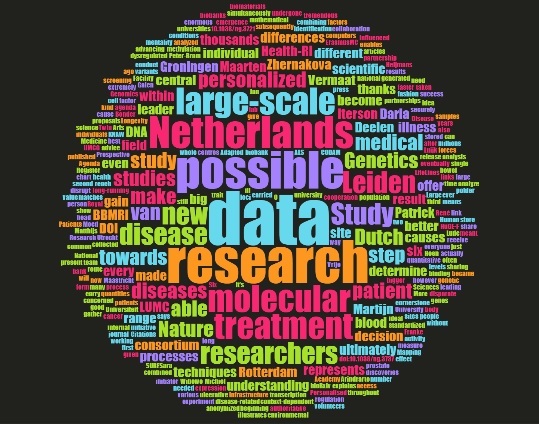 The study links in with the Personalised Medicine route of the National Research Agenda and the Health-RI and M3 proposals on the large-scale research infrastructure agenda of the Royal Netherlands Academy of Arts and Sciences (KNAW). 1. Bonder, Marc Jan, René Luijk, Daria Zhernakova, Matthijs Moed, Patrick Deelen, Martijn Vermaat, Maarten van Iterson et al. "Disease variants alter transcription factor levels and methylation of their binding sites." bioRxiv (2015): 033084. Nature Genetics 2016. 2. Zhernakova, Daria V, Patrick Deelen, Martijn Vermaat, Maarten van Iterson, Michiel van Galen, Wibowo Arindrarto et al. "Identification of context-dependent expression quantitative trait loci in whole blood". Nature Genetics 2016. Adapted from press release by Leiden University.